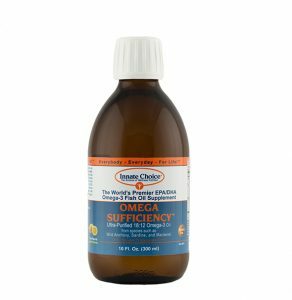 Innate Choice Omega Sufficiency is the world’s premier EPA/DHA Omega-3 fish oil. Sourced exclusively from wild anchovy, sardine and mackerel from pristine cold waters, it is triple molecularly distilled and ultra-purified to pharmaceutical grade and then immediately infused with natural antioxidants ensuring maximum purity and freshness. Omega Sufficiency is also flavored with 100% natural lemon flavor and it tastes great. Importantly, Omega Sufficiency is not chemically altered, it is kept in its natural triglyceride form. Omega Sufficiency is also kept in the natural EPA/DHA ratio and is not chemically concentrated to create unnatural EPA/DHA ratios. Omega Sufficiency is in the form that human genes require. Omega Sufficiency provides the purest, safest, most natural source of EPA/DHA Omega-3 fats possible.